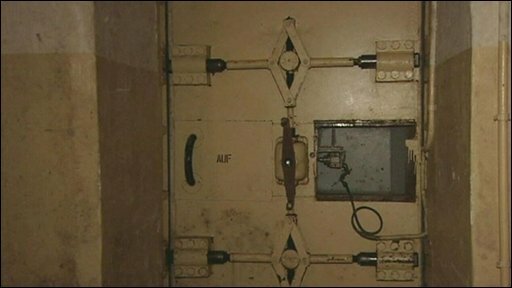 A once-secret bunker designed to shield communist rulers of the former East Germany from a nuclear attack has opened to the public. The three-storey complex, finished in 1983, was intended to house leader Erich Honecker and 400 staff. At the time it was one of the communist world's most advanced bunkers. Now the walls are covered in mould and the decontamination chambers long-defunct. The bunker, north of Berlin, will be open for three months. The Berlin city authorities say they will seal it with concrete afterwards. Honecker, who ruled the German Democratic Republic (GDR) for almost two decades, is thought to have visited the bunker only once. "Contemporary witnesses told us that Honecker was more or less frightened or shocked when he walked through here," said Sebastian Tenschert of the Berlin Bunker Network - a group that campaigned for the bunker to be opened. Groups will be given short tours through the ill-lit complex - where they will see offices and control rooms once intended for the elites, now covered in green slime and reeking of mould. 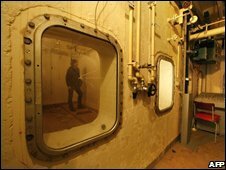 They will be led along submarine-like tunnels divided by heavy metal doors, leading on to 170 rooms. The three storeys reach a depth of 70m (230ft) below ground. The bunker was fitted with a fountain, air conditioning and "springed" rooms able to cushion residents from detonations. It was built in a forest 25km (16 miles) north-east of Berlin, near Wandlitz, where the whole East German government was accommodated in a special colony. The bunker was surrounded by a village occupied almost entirely by members of the feared East German spy agency, the Stasi. Falko Schewe, who worked on the building, described the project - codenamed 17/5001 - as "not that top secret". "My wife and mother knew about the special work which I did, but no-one else knew what I was working on. "I was a very normal GDR citizen except that I worked for the security ministry."